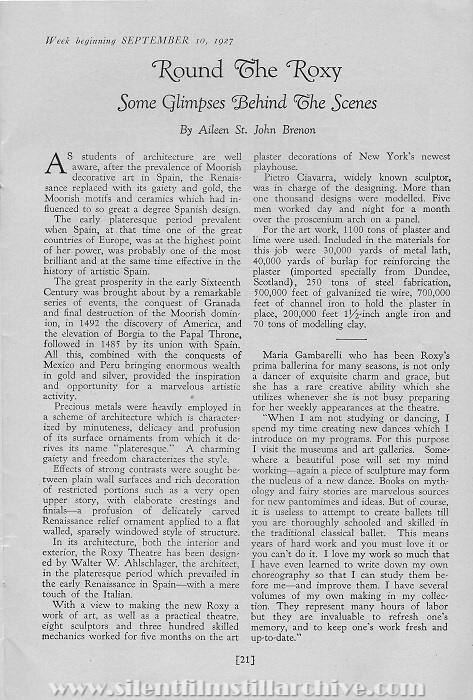 The publishers will mail this magazine weekly for six months to any address in the United States on receipt of One dillar and a Half in advance. Address all communications to Franklin W. Lee Publishing Corporation, 45 W. 45th Street, New York. IT is gratifying to find that the newspapers are showing more and more interest in motion pictures on the stage as well as on the screen. 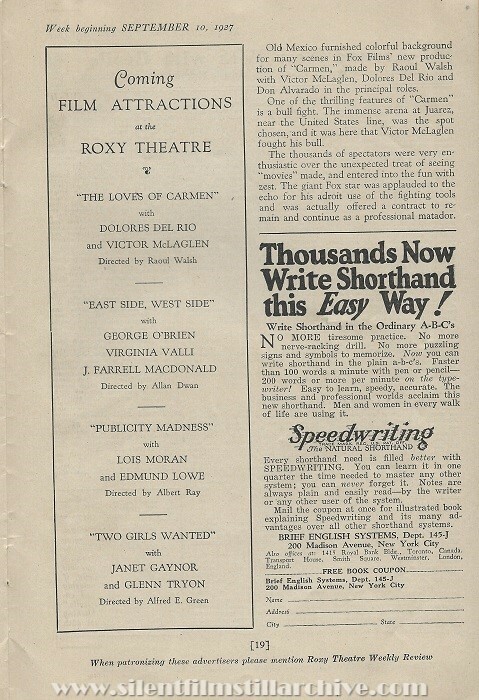 The Roxy has always been exclusively a motion picture theatre, but it does not confine itself entirely to photoplays. There is a difference. A new type of motion picture has been developed which has no connection with celluloid. It includes the silhouette, dancing, stage spectacles, pantomime, pictorial interpretation of music and the fascinating play of lights and colors on animate, as well as inanimate objects. 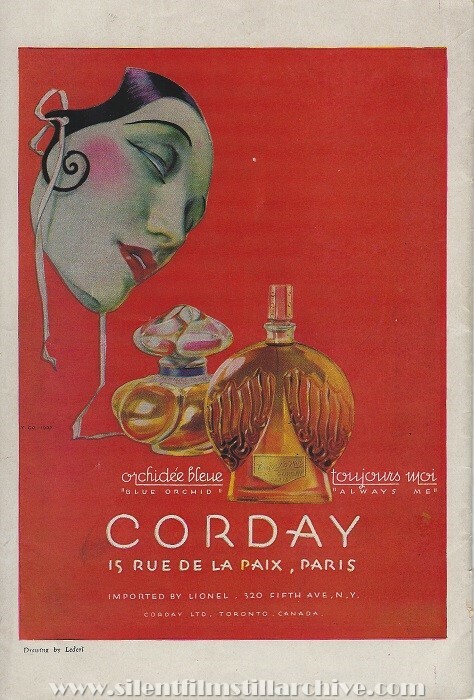 It is our idea of an appropriate entertainment to accompany the photoplay. We believe, also, that the movie loving public shares our view. In fact, our box office has given us absolute proof of it. The press, which had at first looked upon the movie Prologue as an intrusion, has come to a realization of the truth that appropriate stage surroundings add to the enjoyment of a good film. Our prologue to "What Price Glory?" was widely discussed. Mordaunt Hall in the Times wrote of it as "colorful, tuneful and suitable" and Betty Colfax in the Graphic wrote that the "stage presentation adds to the effectiveness of the martial bill." 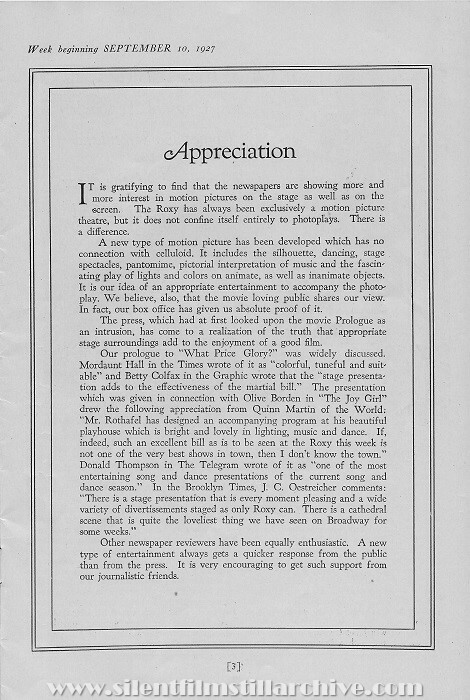 The presentation which was given in connection with Olive Borden in "The Joy Girl" drew the following appreciation from Quinn Martin of the World: "Mr. Rothafel has designed an accompanying program at his beautiful playhouse which is bright and lovely in lighting, music and dance. If, indeed, such an excellent bill as is to be seen at the Roxy this week is not one of the very best shows in town, then I don't know the town." Donald Thompson in The Telegram wrote of it as "one of the most entertaining song and dance presentations of the current song and dance season." In the Brooklyn Times, J. C. Oestreicher comments: "There is a stage presentation that is every moment pleasing and a wide variety of divertissements stage as only Roxy can. There is a cathedral scene that quite the loveliest thing we have seen on Broadway for some weeks. Other newspaper reviewers have been equally enthusiastic. A new type of entertainment always gets a quicker response from the public than from the press. It is very encouraging to get such support from our journalistic friends. A LITTLE more than a year ago, a demure Philadelphia girl flshed on the screen in her first featured role. Today she has to her credit the two prize roles for the current year. Exactly twelve months has spelled stardom, and the story of those months is the latest romance of Hollywood. The girl is Janet Gaynor, who promises to be the big find in filmdom for the past year. 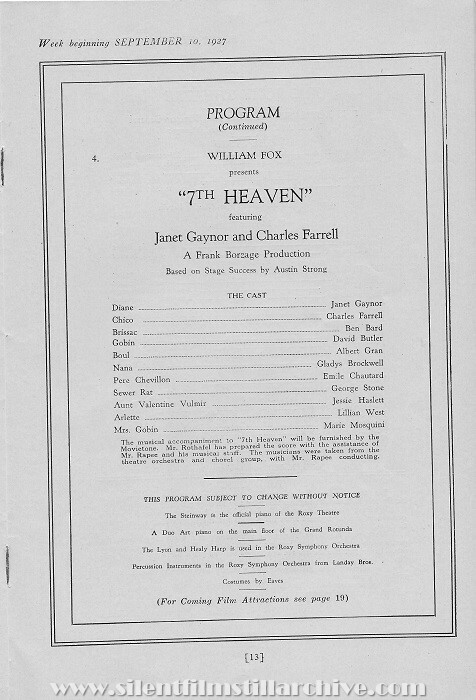 In "Seventh Heaven," the screen version of Helen Mencken's stage play, Janet is a very appealing Diane, and in "Sunrise," directed by a famous German Director, F. W. Murnau, which is soon to make its bow to the public, janet Gaynor takes the lead role. Let us go back a little while. In a busy San Francisco business office we might have discoered a super-attractive young seccrtary. Efficiently, albiet unwillingly, she carried her notebook and pencils day after day, sat through hours of dictation , making pothooks until the pages of her notebook swam before her eyes. She looked ahead to years of being just a secretary and of knowing the she hated the job, but her mother had decided that her's (sic) was to be a business career, and so she stuck. That girl was Janet Gaynor, unheard of in Hollywood, but with a longing in her heart to join the ranks of the film world in the capital of filmdom. Janet Gaynor might still be banding the keys of the typewriter had it not been for her stepfather, who she affectionately calls Jonsay. Jonsey and Janet are pals in real life, and it was he who discovered her talent dramatic ability while Janet was in her teens. "While I was still in the kindergarten, I used to put on a theatrical performance every night," Janet says. "Jonsey -- that's my stepfather -- was the sole audience at the performance because they were staged while mama was superintending the dinner arrangements. "When I began high school mother insisted that I should take training that would fit me for business. After I had been graduated I went into a big office as a junior secretary. I tried so hard to make good that at the end of six months my health showe the strain and Jonsey put the foot down and said no more of it. He declared that I was an actress and that if mother insisted on m doing something I shoud have an opportunity to do that which suited me best. He announced that the bank account was large enough to give me a chance in Hollywood among the film folks. Gee, I was happier than Mike, my Kerry terrier, over a chicken bone. Finally mother accepted Jonesy's decision and we went to Hollywood, arriving early in December of 1924. We took two or three weeks off just to see Los Angeles and Southern California. Then I started to look for a chance to break into the movies. I started the day before Christman. The day after Christmas I found a job as an extra. I was takin on for more extra parts and then I was gien a lead with Pee Wee Holmes ina series of comedies. "After some time in such parts, I walked into the Fox Films casting office one day and asked if they has anything in sight for a little actress like myself. 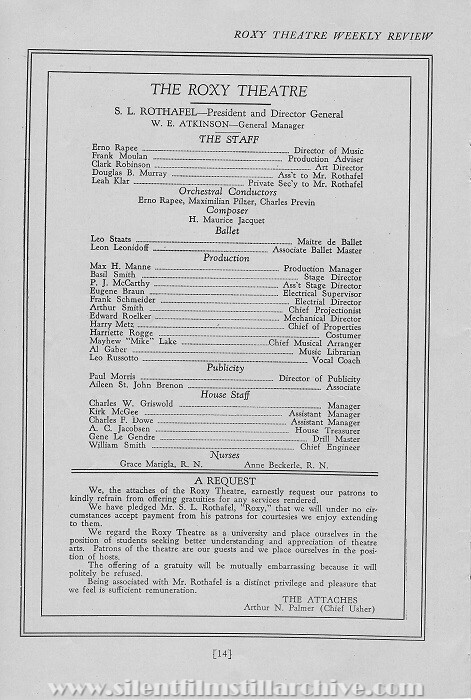 I was sent to Director Irving Cummings for a screen test because he was hunting for a girl to play Anne Burger in "The Johnstown Flood." I was gievn the part. Then came my big opportunity. Mr. Murnau engaged me to play in 'Sunrise." Now I'm playing Diane in 'Seventh Heaven.'" So it is that Janet covers this remarkable year in Hollywood. She has never worried about stardom. She never will worry about stardom. Worry is the least of her troubles. She concentrates upon the task in hand and trusts the future to take cre of itself, and this, according to experienced directors, is the secret of her success. Despite the fact that she is not yet twenty, Janet, in all her pictures, has managed to dominate every scene in which she has appeared. According to Scheitzinger, the director, she has the maturity of the ages, and yet is singularly youthful. In Frank Borzage's opinion, whe is still a girl, and yet in the death scene of "Peter Grimm" she rose to dramatic heights, worthy of an old and experienced actress. 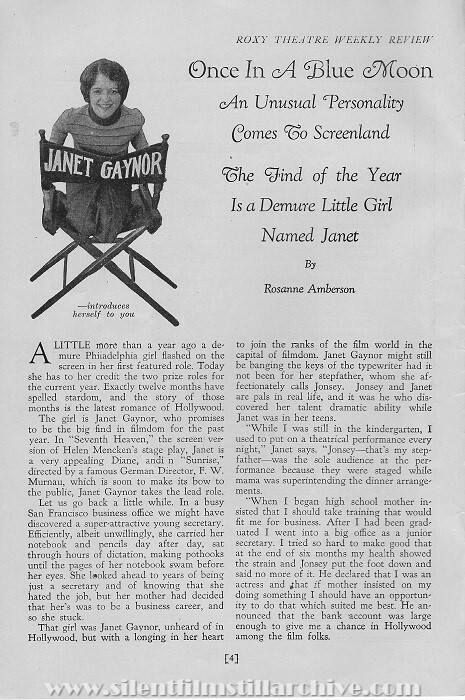 If you have read the papers recently you have found Janet Gaynor's name over and over again. She has faced the terrible New York critics and won them, which is a triumph in itself. They have agreed with scarcely a dissenting voice that in "Seventh Heaven" she is a perfect Diane, playing the part with sympathy, tenderness and apurely natural touch. 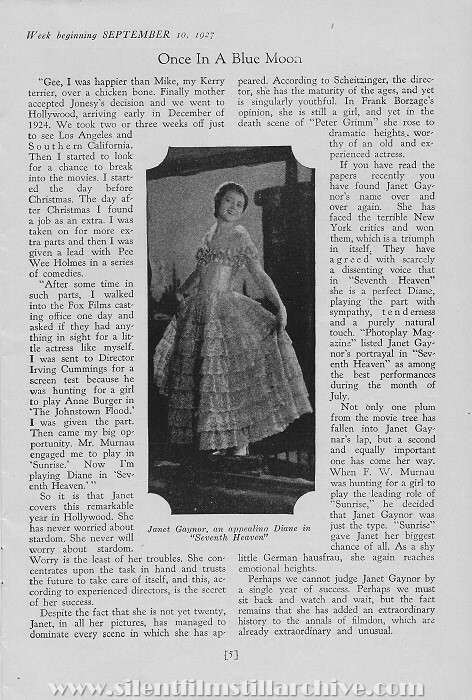 "Photoplay Magazine" listed Janet Gaynor's protray in "Seventh Heaven" as among the best performances during the month of July. Not only one plum from the movie tree has fallen into janey Gaynar's (sic) lap, but a second and dqually important one has come her way. When F. W. Murnau was hunging for a girl to play the leading role of "sunnrise," he decided that Janey Gaynor was just the type. "Sunrise" gave Janet her biggest chance of all. As a shy little German hausfrau, she again reaches emotional heights. Perhaps we cannot judge Janet Gaynor by a single year of success. Perhaps we must sit back and watch and wait, but the fact remains that she has added annextraordinary history to the annals of filmdon, which are already exraordinary and unusual. 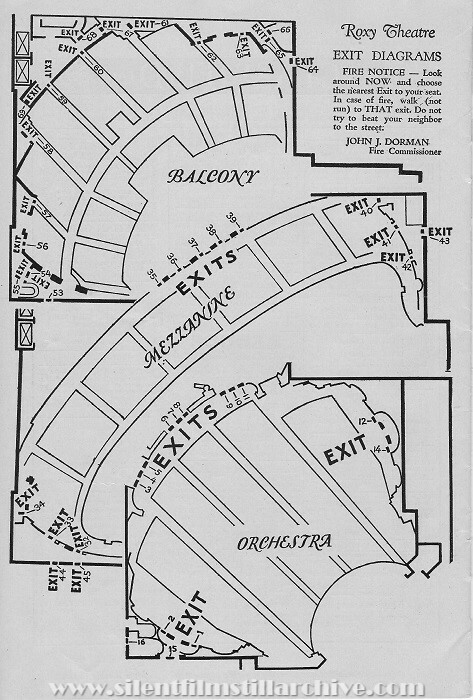 Under the Personal direction of S. L. ROTHAFEL, "Roxy"
Fire Notice -- Look around NOW and choose the nearest Exit to your seat. In case of fire, walk (not run) to THAT Exit. Do not try to beat your neighbor to the street. De Luxe performances at 2:00; 4:00; 7:15; and 9:15 P.M. 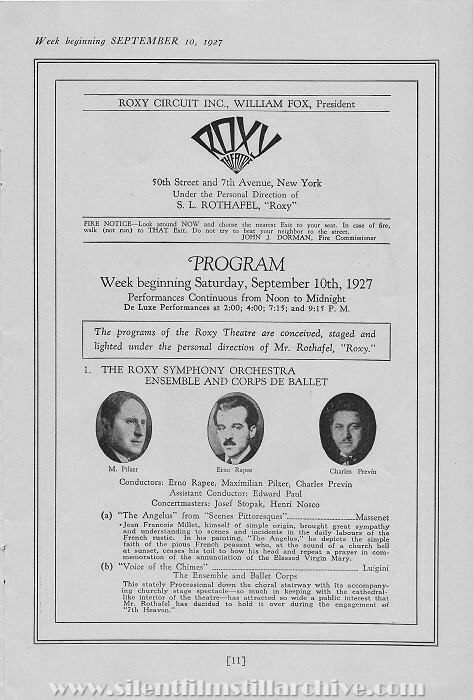 The programs of the Roxy Theatre are conceived, staged and lighted under the personal direction of Mr. Rothafel, "Roxy." Jean Francois Millet, himself of simple origin, brought great sympathy and understanding to scenes and incidents in the daily labours of the Franch rustic. In his painting, "The Angelus," he depicts the simple faith of the pious French peasant who, at the sound of a church bell at sunset, ceases his toil to bow his head and repeat a prayer in commemoration of the annunciation of the Blessed Virgin Mary. This stately Processional down the choral stairway with its accompanying churchly stage spectable -- so much in keeping with the cathedral-like interior of the theatre -- has attracted so wide a public interest that Mr. Rothafel has decided to hold it over during the engagement of "7th Heaven. The musical accompaniment to "7th Heaven" will be furnished by the Movietone. Mr. Rothafel has prepared the score with the assistance of Mr. Rapee and his musical staff. 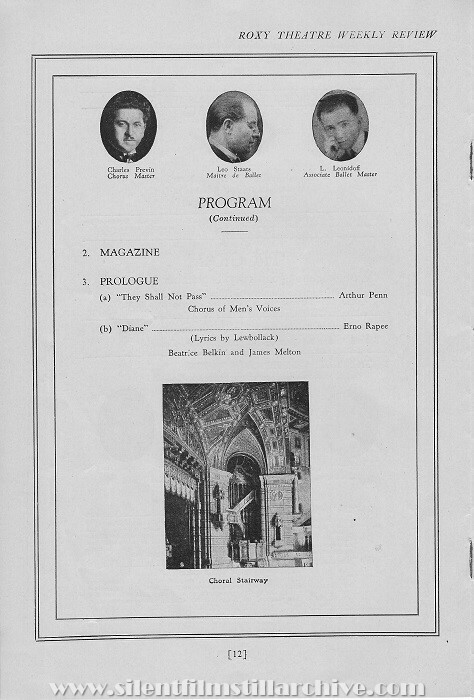 The musicians were taken from the theatre orchestra and choral group, with Mr. Rapee conducting. THIS PROGRAM SUBJECT TO CHANGE WITHOUT NOTICE. The Steinway is the official piano of the Roxy Theatre. The Lyon and Healy Harp is used in the Roxy Symphony Orchestra. Percussion Instruments in the Roxy Symphony Orchestra from Landay Bros.
We, the attaches of the Roxy Theatre, earnestly request our patrons to kindly refrain from offering gratuities for any services rendered. We have pledged Mr. S. L. Rothafel, "Roxy" that we will under no circumstances accept payment from his patrons for courtesies we enjoy extending to them. We regard the Roxy Theatre as a university and place ourselves in the position of students seeking better understand and appreciation of theatre arts. Patrons of the theatre are our guests and we place ourselves in the position of hosts. The offering of a gratuity will be mutually embarrassing because it will be politely be refused. Being associated with Mr. Rothafel is a distinct privilege and pleasure that we feels is sufficient remuneration. Old Mexico furnished colorful background for many scenes in Fox Films' new production of "Carmen," made by Raoul Walsh with Victor McLaglen, Dolores Del Rio and Don Alvarado in the principal roles. One of the thrilling features of "Carmen" is a bull fight. The immense area at Juarez, near the United States line, was the spot chosen, and it was here that Victor McLaglen fought his bull. The thousands of spectators were very enthusiastic over the unexpected treat of seeing "movies" made, and entered into the fun with zest. The giant Fox star was applauded to the echo for his adroit use of the fighting tools and was actually offered a contract to remain and continue as a professional matador. Thousands Now Write Shrothand this Easy Way! NO MORE tiresome practice. No more nerve-racking drill. No more puzzling signs and symbols to memorize. Now you can write shorthand in the plain a-b-c's. Faster than 100 words a minute with pen or pencil-- 200 words or more per minute on the typewriter! Easy to learn, speedy, accurate. The business and professional worlds acclaim this new shorthand. Men and women in every walk of life are using it. Trade Mark Reg. U.S. Pat. Off. Every shorthnd need is filled better with SPEEDWRITING. You can learn it in one quarter the time needed to master any other syste; you can never forget it. Notes are always plain and easily read -- by the writer or any other user of the system. Mail the coupon at once for illustrated book explaining Speedwriting and its many advantages over all the other shorthand systems. Also offices at: 1415 Royal Bank Bldg., Toronto Canada. Transport House, Smith Square, Westminster, London, England. AS students of architecture are well aware, after the prevalence of Moorish decorative art in Spain, the Renaissance replaced with its gaiety and gold, the Moorish motifs and ceramics which had influenced to so great a degree Spanish design. The early plateresque period prevalent withn Spain, at that time one of the great countries of europe, was at the highest point of her power, was probably oneof the most brilliant and at the same time effective in the history of artistic Spain. Precious metals were heavily employed in a scheme of architecture which is characterized by minuteness, delicacy and profusion of its surface ornaments from which it derives its nae "plateresque." A charming gaiety and freedom characterizes the style. Effects of strong contrasts were sought between plain wall surfaces and rich decoration of restricted portions such as a very open upper story, with elaborate crestings and finials -- a profusion of delicately carved Renaissance relief ornament applied to a flat walled, sparsely windowed style of structure. 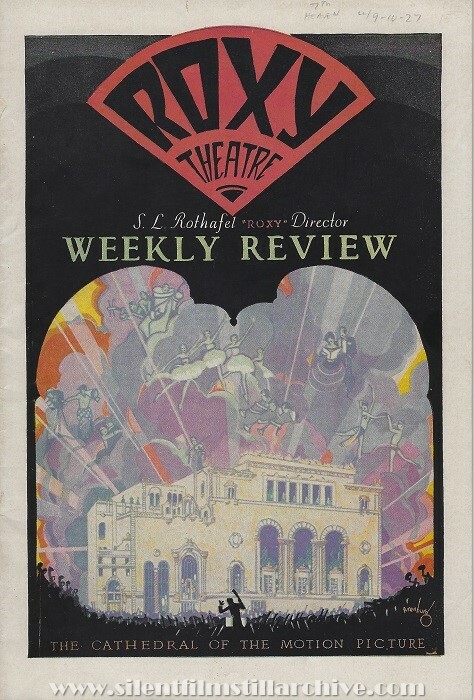 In its architecture, both the interior and exterior, the Roxy Theatre has been designed by Walter W. Ahlschlager, the architect, in the plateresque period with prevailed in the early Renaissance in Spain -- with a mere touch of the Italian. 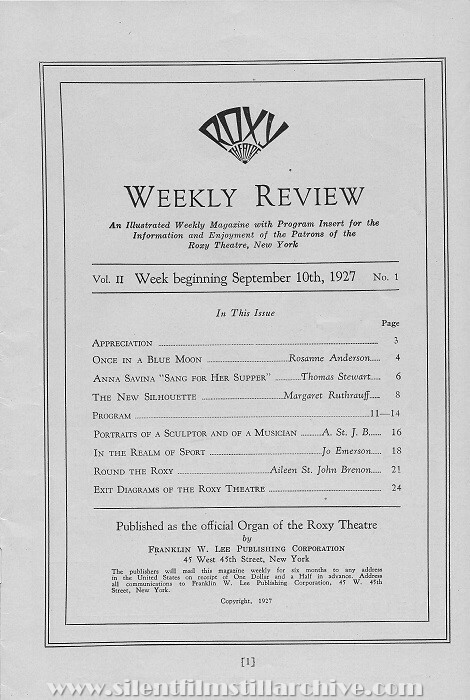 With a view to making the new Roxy a work of art, as well as a practical theatre, eight sculptors and three hundred skilled mechanics worked for five months on the art plaster decorations of New York's newest playouse. Pietro Ciavarra, widely known sculptor, was in charge of the designing. More than one thousand designs were modelled. Five men worked day and night for a month over the proscenium arch on a panel. For the art work, 1100 tons of plaster and line were used. Included in the materials for this job were 30,000 yards of metal lath, 40,000 yards of burlap for reinforcing the plaster (imported specially from Dundee, Scotland), 250 tons of steel fabrication, 500,000 feet of galvanized tie wire, 700,000 feet of channel iron to hold the plaster in place, 200,000 feet 1 1/2-inch angle iron and 70 tons of modelling clay. Maria Gambarelli who has been Roxy's prima ballerina for many seasons, is not only a dancer of exquisite charm and grace, but she has a rare creative ability which she utilizes whenever she is not busy preparing for her weekly appearances at the theatre. "When I am not studying or dancing, I spend my time creating new dances which I introduce on my programs. For this purpose I visit the museums and art galleries. Somewhere a beautiful pose will set my mind working -- again a piece of sculpture may form the nucleus of a new dance. Books on mythology and fairy stories are marvelous sources for new pantimimes and ideas. But of course, it is useless to attempt to create ballets till your are throoughly schooled and skilled in the traditional classical ballet. This means years of hard work and your must love it or you can't do it I love my work so much that I have enen learned to write down my own choreography so that I can study them before me -- and improve them. I have several volumes of my own making in my collection. They represent many hours of labor but they are invaluable to refresh one's memory, and to keep one's work fresh and up-to-date. Imported by Lionel 320 Fifth Ave., N.Y.